Can your current part washing system be improved with a simple basket redesign, saving you time and money? 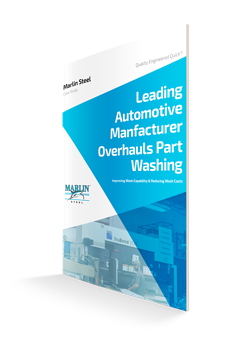 A leading automotive manufacturer in the industry came to Marlin Steel with a big problem: their wash system was inefficient, racking up inventory-carrying costs and slow delivery times. Marlin Steel's mechanical engineers assessed their situation to better understand how to help this client improve their wash system. We came up with the solution of building a better designed wire basket for this client's application. How custom baskets significantly reduce wash time. How washing operations were improved. How inventory-carrying costs dramatically decreased. Read how Marlin Steel fixed this leading automotive manufacturers problem by filling out the form to the right.